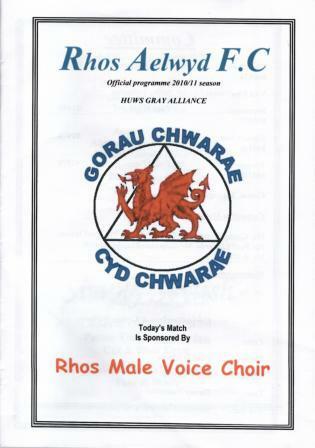 Rhos Aelwyd were promoted to the Cymru Alliance last season. They are a tiny club that have had a great season and an unexpected fourth place finish. They even beat Rhyl away, recently. I was keen to see the new surprise package of Welsh football, not least to wonder at the contrast between the English and Welsh leagues. The equivalent placed team in England is Cardiff, or taking into account there being two Welsh second tiers, Burnley. In terms of number of teams alone, Rhos Aelwyd finished joint 20th best team in Wales, equivalent to West Ham. Compare Upton Park, 35,000 seater mega stadium to Ponciau Park, openly accessible to the public, with no floodlights and a tiny stand with wooden benches. This is no criticism of Rhos, quite the opposite. I think it’s great that a team can rise to such heights in the Welsh league, within touching distance of the top flight, from such a humble base. The name Rhos is short for the town Rhosllannerchrugog, a large village south of Wrexham. Aelwyd has no direct English equivalent word but reflects the warmth, feelings and memories of home. 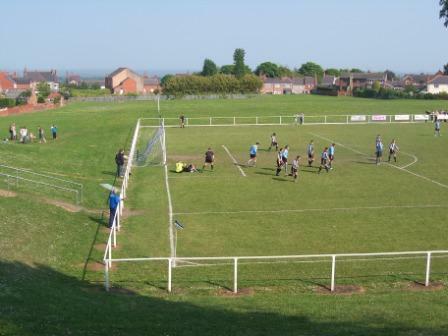 Rhos Aelwyd have been going since 1943, but football has been played in Rhos continually since 1877 by a bewildering array of clubs and names, starting with Llannerchrugog Hall and their defeat to Wrexham Civil Service (1-0). 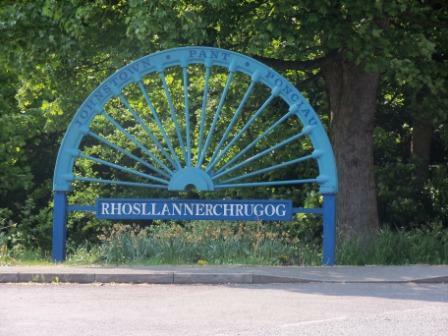 After that there was Rhos (Olympic+Levers+Comrades+Eagle Wanderers+Early Closes+Rangers+United+Church+Albino+Victoria+Athletic+Chums) [expand the brackets] as well as just Rhos and Rhosllannerchrugog, Ponciau Welfare and Llannerch Colts. They have had more suffixes then there are suffixes in the whole of the English League. Compared to some of them Aelwyd doesn’t seem that strange. I mean – Albino? 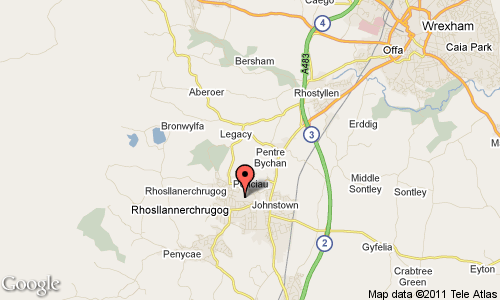 Rhosllannerchrugog means Moor of the Heathery Glade and has a population of around 10,000. The ground is in the Ponciau region, hence the name of the ground, Ponciau Park. The ground is not enclosed so the gate fee of three pounds for adults and nothing for children is taken by two people at the top of the park, at both ends, and taken on trust. You can easily slip through a few gaps in the hedge from the adjacent playground; not that you’d be tempted at such reasonable prices. The ground is part of the larger Ponciau Municipal Park, which seems to be kept very well. The playground was a sight for sore eyes as I had my two boys with me and we had 45 minutes to kill beforehand. I was a little apprehensive beforehand at the size of the ground I was visiting. Would it be worth the trip to Wales for little more than pitch? It certainly was. Ponciau Park has masses of character for its size. 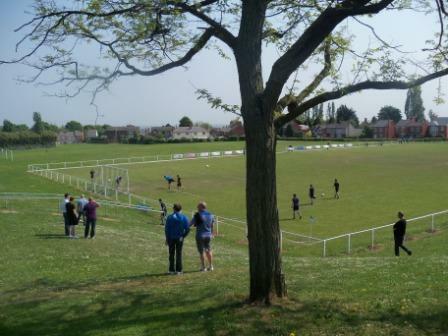 The huge grass bank that slopes down, at a perfect angle, from the playground on top, was strewn with spectactors enjoying the football in the sun. The club were very welcoming and very relaxed about people coming in and out at leisure. The game was good entertainment with Cefn Druids taking an early lead but Rhos equalising soon after, breaking a personal run of 23 games since seeing both teams score in the first half. The second half was a close affair but Cefn scored the only goal to take all three points. 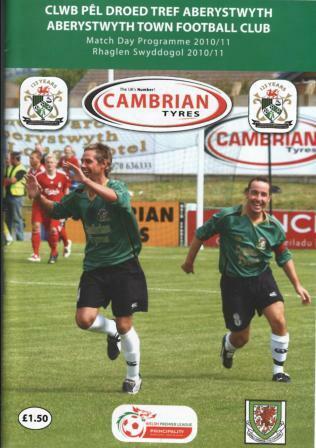 This was quite a local derby as Cefn play in nearby Rhosymedre, just a few miles south. Once again, another excellent Welsh ground. 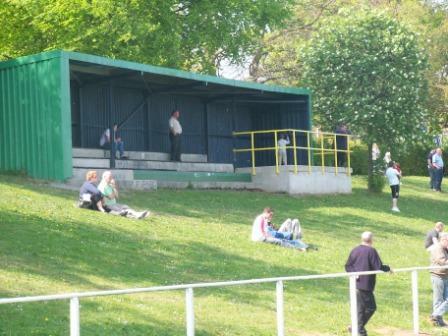 This entry was posted in Groundhopping, Travelog, Welsh football and tagged Cefn Druids, cymru alliance, ponciau park, rhos aelwyd, rhosllannerchrugog. Bookmark the permalink. 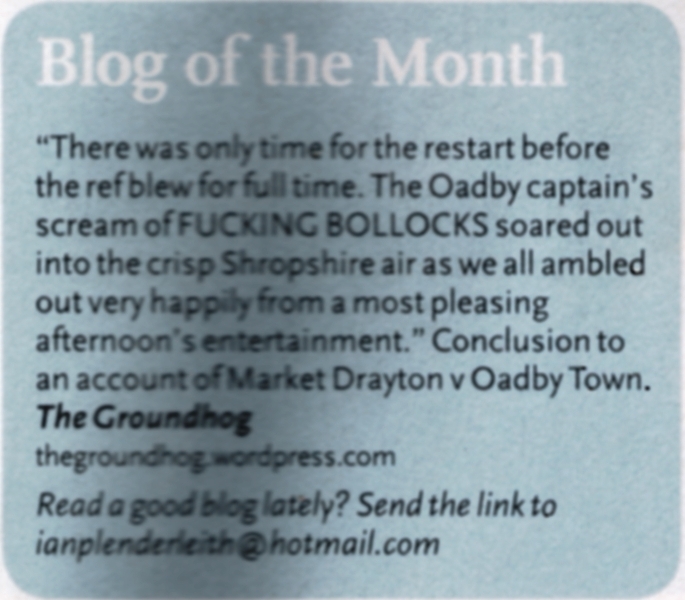 great review – brings back memories. I payed for Rhos in the 80’s in goal and its changed a lot – we didnt have a astand or railings ;we had to wheel ou ta rope to keep the crowds(!) back every game and then take it back in. Great club . great people and happy memories! !